LONDON, 2017-Jul-17 — /Travel PR News/ — One of London City Airport’s fundraising focal points of the year is on course to raise £30,000 for Richard House Children’s Hospice, a local Newham charity which provides care for children and young people with life-limiting illnesses. 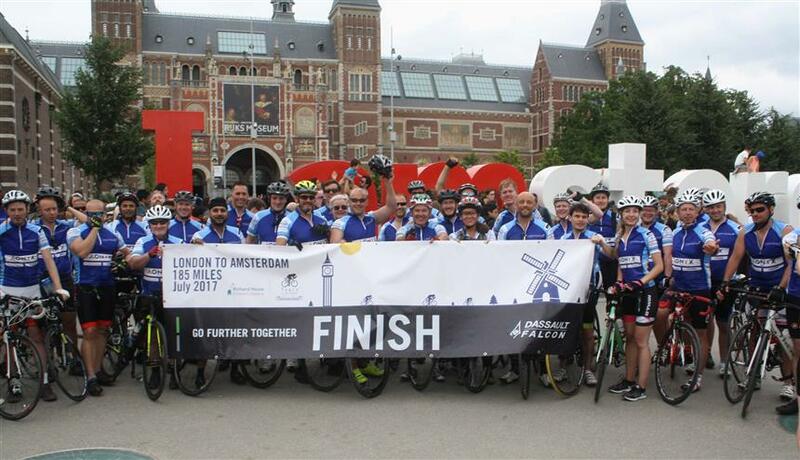 On Friday 7 July, fifty-two cyclists set off from London City Airport in the July heat for a gruelling 185-mile bike ride to Amsterdam. In what is the fourth year in a row that the airport has organised an annual bike ride, it was the most participants ever to join the two-wheel adventure, a special achievement to mark the airport’s 30th anniversary. The airport has maintained longstanding support for Richard House Children’s Hospice, raising a close to £900,000 since it first began fundraising initiatives over two decades ago. The group of cyclists included a wide range of London City Airport employees and airport-based staff, who were joined by Stephen Timms, MP for East Ham, who also completed the challenge, raising money via his Just Giving page. Stephen Timms, MP for East Ham, said: “Richard House has done a tremendous job in caring for children and providing support for their families since it opened in 2000. And London City Airport – which stands just a few hundred yards from Richard House – has been a long-term supporter of the hospice. Declan Collier, CEO of London City Airport, said: “The annual charity bike ride continues to grow in scale each year, with colleagues demonstrating tremendous energy and enthusiasm in our 30th anniversary year to fundraise and take part in the endeavour. The route took the group through Essex and Suffolk to Harwich, before boarding the ferry to the Hook of Holland and completing the final leg on Dutch soil, arriving in Amsterdam late on Saturday afternoon. Among the participants was customer service agent Pam Kaur, who remarkably had never ridden a bike before the Amsterdam trip, using the opportunity as an incentive to learn, and training twice a week ahead of the trip. Cyclists were also met with supporters and onlookers during the journey, including two little girls from Harwich, India Cranston and Avaleigh Brockman, who donated £1.50 of their pocket money. Previous destinations for the airport’s annual bike ride include Lille (2016), Rotterdam (2015) and Amsterdam (2014). For more on media relations. This entry was posted in Airports, Festivals and Events, Sports, Travel Management and tagged annual charity bike ride, Declan Collier, donation, Libby Basson, London City airport, Richard House Children’s Hospice. Bookmark the permalink.